Chuck Asay produces some really good cartoons that include very important economics insights. Here are some of my favorites. Economic growth and an expanding welfare state. Job creation and the burden of government. The impact of regime uncertainty. Whether interest groups should self-regulate their greed. Here’s another one that is worth sharing. But I don’t want to give Asay all the credit. 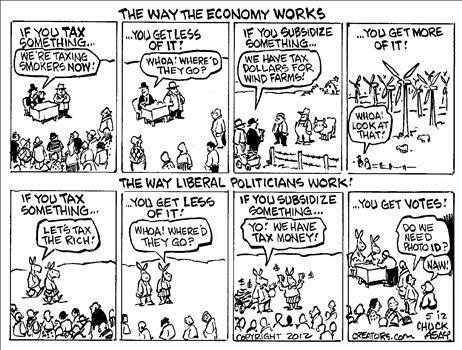 Other cartoonists also produce funny cartoons with very good messages about economics. This Scott Stantis gem on “stimulus” spending. This Lisa Benson cartoon on Keynesian economics. This Wizard of Id parody on redistribution by anonymous. This Michael Ramirez cartoon on the impact of unemployment benefits. P.S. While I like all of these cartoon and urge you to share them widely, I also hope that you can utilize my educational videos on topics such as tax competition, government spending, and the Laffer Curve. Not everything can be explained in a picture.